Distances to places within our Solar System in Chapter 1 (see Figure 7.2) provided a yardstick to measure human ambition. At its speed (about 300,000 km/s), light traveling from the Earth to Pluto would reach it (in the average) in 5.45 hours. The highest speed reached by human handicraft is probably the Cassini-Huygens probe while traveling to Saturn in 2004 at about 40 km/s, or 7,500 times less than the speed of light. The minimum A V needed to reach destinations in our Solar System are extremely small when compared with the speed of light (see Figure 7.1). However, because of the very low Isp available with chemical propulsion, the mass that must be accelerated and ejected to produce these AVs is a significant fraction of the total mass of a spacecraft, as stated by Newton's Second Law written in the form of Tsiolkowski's equation. This is a fact of life in our Universe. 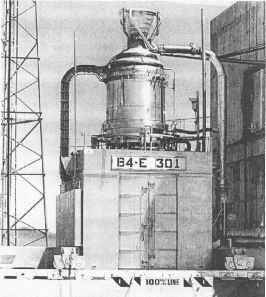 The consequence is that within our current technology (based still on chemical rockets) the only affordable strategy is to impart spacecraft no more than these minima AV. In practice, that means quick acceleration, lasting perhaps minutes, followed by coasting at zero acceleration (inertially) to the final destination. The optimal trajectory embodying this strategy is called a Hohman's trajectory. Because the AV are modest, the coasting speed will be similarly modest, the sum of the A V to reach LEO and of the A V in Figure 7.1. Figure 7.1. 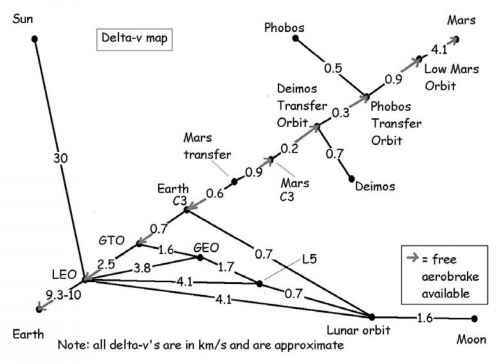 Minimum DV to reach selected destinations in our Solar System.